Fig. 1. Mechanisms for preserving mucosal barrier function. 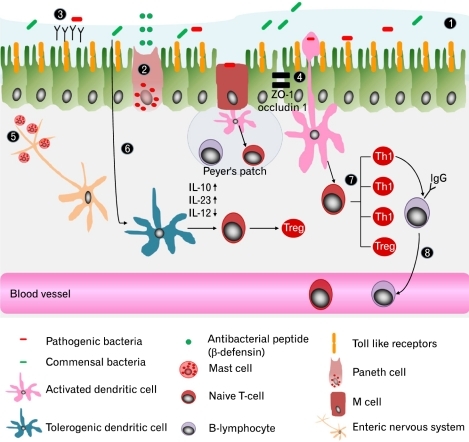 To protect intestinal epithelium from noxious inflammatory process, there are several mechanisms to preserve mucosal barrier function; ① mucous layer, ② production of antimicrobial peptides by paneth cell, ③ secretary IgA and ④ epithelial-cell tight junction complex (eg, ZO-1 and occludin 1). Specialized intestinal epithelial cells which overlie Peyer's patches facilitate luminal sampling and transport of microbiota. ⑤ Mucosal mast cells are increased in small and large bowel. Their localization, number and mediators are correlated with generation of irritable bowel syndrome (IBS) symptom. Increased mast cells close to ending of nerve fiber are associated with perception of pain in IBS patients. ⑥ Dendritic cells (DC) interact with gut microbiota and other stimuli to determine if immune response or tolerance will be induced. Microbial factors interact with different DC cell surface pattern recognition receptors to determine DC maturation that produce IL-1β, IL-6 and IL-23. Activated DCs subsequently regulate the differentiation of naïve T cells into Th1, Th2, Th17 or Treg. In IBS patients infiltration of CD3+ and CD25+ T cells are increased in colonic mucosa and blood T cell are activated with expression CD 69 and HLA-DR/integrin β7. The proinflammatory cytokines from Th1 induce switching to IgG producing cell. Frequency of ⑦ IgG+ B cells are increased in the blood of IBS patients with increased expression of CD80/86.